New York — Stars from the world of entertainment and sport including Mahershala Ali, David Beckham, the All Blacks, Daniel Cormier, Novak Djokovic, Lewis Hamilton, Hugh Jackman, Sachin Tendulkar, Thalía and Chris Weidman joined Super Dads, a new UNICEF initiative launched today to celebrate fatherhood, and highlight the importance of love, play, protection and good nutrition for the healthy development of young children's brains. 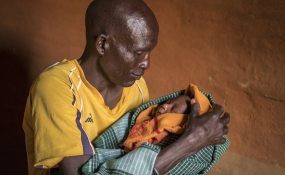 With more than 90 countries celebrating Fathers' Day this month, the initiative invites families to post photos and videos of what it takes to be 'super dads,' using the hashtag #EarlyMomentsMatter on their Instagram and Twitter accounts. To inspire families across the world to share their 'super dads' moments, photos and videos of UNICEF ambassadors and supporters who have got behind the campaign will be posted on UNICEF's Instagram and Twitter, and featured on the campaign gallery between 6 and 18 June. "As a father, I've seen for myself the impact that every smile, every bit of love, and every positive action has had on my child during these precious early years of life. Being a new parent isn't easy. There are many challenges that fathers across the world face. This campaign is about supporting and encouraging fathers so they can be the Super Dads their kids desperately need," said UNICEF Goodwill Ambassador Novak Djokovic. "I wouldn't be where I am today without the support of my dad, there's no question about that. He was involved right from the start and gave me all the love, guidance, decent food, and care that I could have wished for. I'll remain forever grateful to him for that," said UNICEF supporter Lewis Hamilton. "I hope this initiative celebrates dads like mine across the world and helps those who are struggling get the support they need to be super dads too." "When I was a young child, my father gave me the right amount of love, freedom and support to shape who I am today," said UNICEF Ambassador Sachin Tendulkar. "Every kid needs protection, love, good food and play to support growth and development, and it's up to both parents to provide these." One such super dad is South Sudanese refugee Idro, who is raising three daughters aged 2 months, 3 and 13 years old in Uganda's Bidi Bidi refugee settlement, the largest in the world. Idro fled his war-torn country in July 2016, and is doing everything he can to keep his young daughters' healthy, happy and safe. "My daughter asks me "when are we going home", I hold her to my side to comfort her. I play games with her and carry her. She must feel that I love her. If I can't fulfil for my family, I am not happy," said Idro. "The earliest years of life present a critical, once-in-a-lifetime opportunity to shape children's brain development - and it's their parents who hold the largest stake in this process," said Pia Britto, UNICEF Chief of Early Childhood Development. "The more fathers, mothers and other family members shower their babies and young children with love, play, good nutrition and protection, the better these children's chances are of reaching optimal health, happiness and learning ability. Good parenting for young children living in highly stressful conditions like conflict or extreme poverty can even provide a buffer, helping them to fully develop despite adversity," said Britto. Good parenting in early childhood, especially during the first 1,000 days, sparks neural connections in children's brains, laying the foundation for their future successes. Research suggests that when children positively interact with their fathers, they have better psychological health, self-esteem and life-satisfaction in the long-term. "We need to break down the employment and societal obstacles that deprive fathers - and mothers - of precious time with their young children," said Britto. "It is critical that the private sector and governments work within their communities to give parents and caregivers of babies the time, resources and information they need to give children the best start in life." The 'Super Dads' initiative forms part of UNICEF's #EarlyMomentsMatter campaign, which aims to drive increased understanding of how children's environments and experiences in early childhood can shape their future health, well-being, ability to learn, and even how much they will earn as adults. All photo and video submissions to the Super Dads initiative will feature on the #EarlyMomentsMatter gallery. UNICEF will select the most heart-warming, humorous, and imaginative photo and video submissions post them on the organization's own digital platforms.